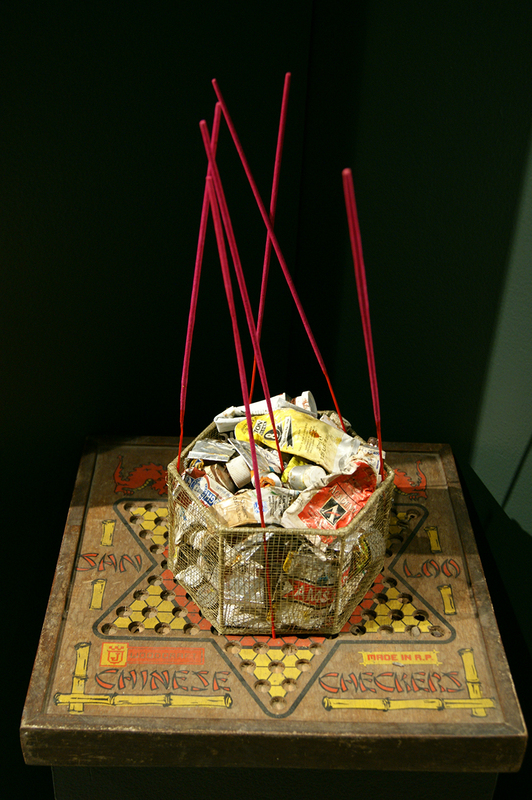 Cian Dayrit’s art practice has continually drawn from the complex interface between the colonial encounter, local ethnography, and strategies of display. Exploring pictorial tropes from fictive archaeology to folk millenarianism, Dayrit reveals a willingness to embrace these diverse encounters with local history and transform these into materials for the critique of empire. 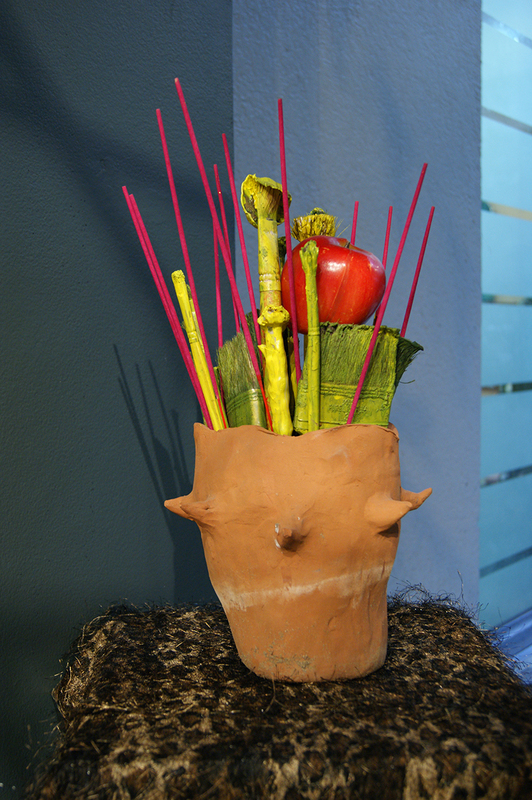 This recent one-man exhibition, titled ‘Spectacles of the Third World’, revolves around the ubiquitous Philippine fiesta as an appropriated environment. Introduced and popularised during the period of Hispanic colonisation in the archipelago, these annual celebratory feast days are capped by bountiful and generous folk festivities, the wielding of visual and performative attraction-strategies aimed at the local populace, and the conduct of rituals addressed to patron saints: all collective gestures of patronage and power, obeisance and desire. 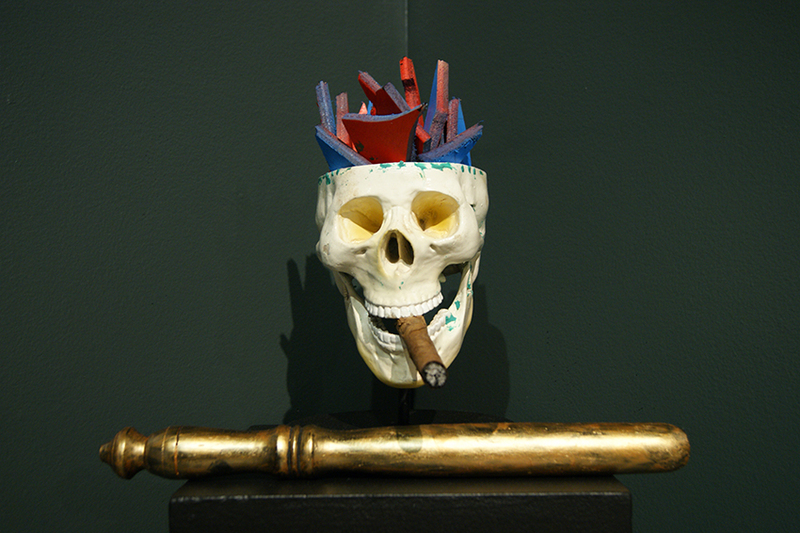 In this exhibition, Dayrit employs several modes of display and representation. 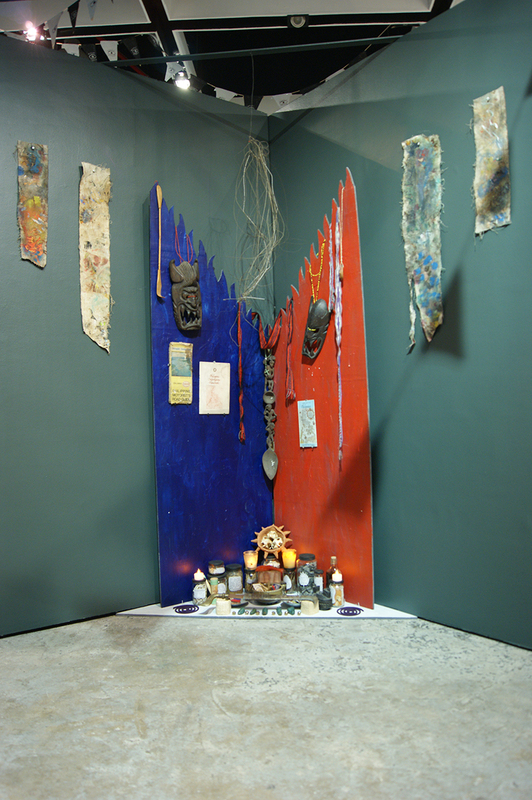 He produces a roomful of installation and intermedia works revolving around several motifs within the Philippine fiesta: the grand gesture of thanksgiving and largesse signified by the feast table, overflowing with food; the decorative banderitas or flaglets that delineate the boundaries of town festivities, the atmosphere of gaiety conjured by the multi-sensory onslaught of confetti, music and folk games. Yet fiestas also harbour a dual nature. They can be seen as a cultural instrument making stable and natural the colonial project but also, conversely, as a phenomenon capable of undermining its rule. 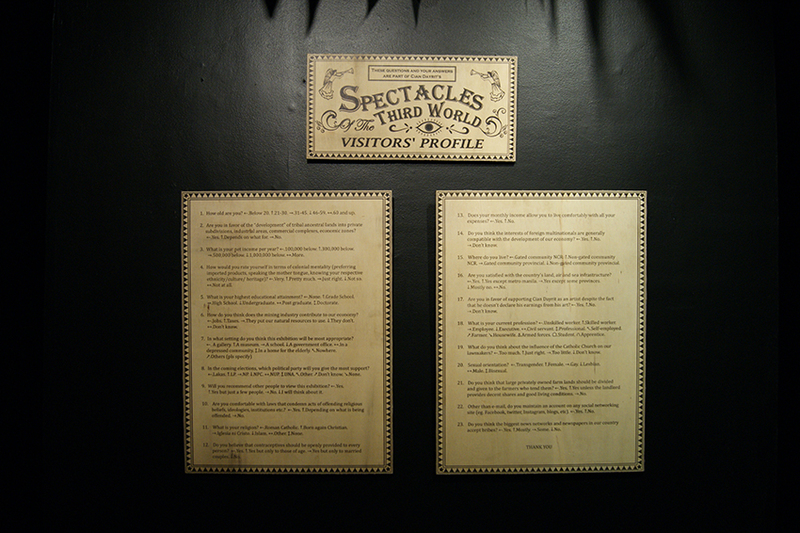 Encountered as a suite of spectacles, Dayrit’s various installations stand as parodies of the current socio-political and cultural ills of the nation. 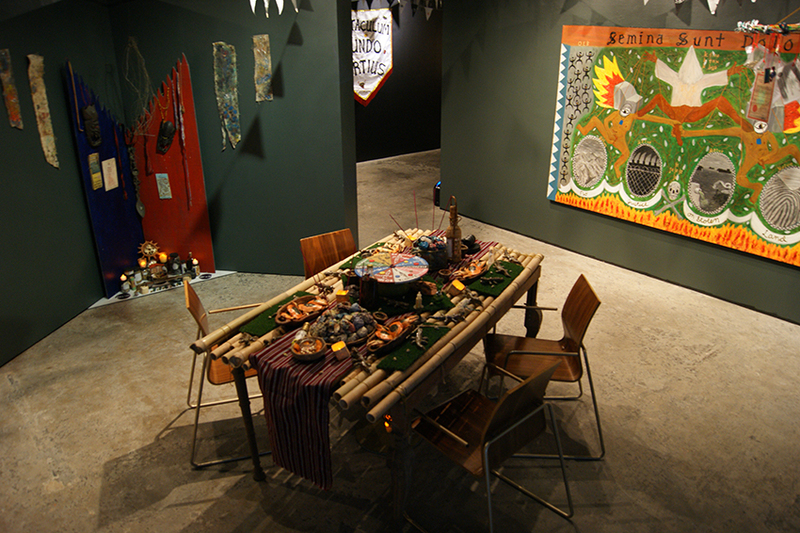 Positioned as the locus of the exhibition is the feast table, laden with faux food. Titled Flavours of our Culture and Heritage, it parodies as a gustatory spectacle numerous linguistic and cultural references to the decay of contemporary society: the wheel of torture as a platter, crabs and crocodiles as main dishes of a grim repast. 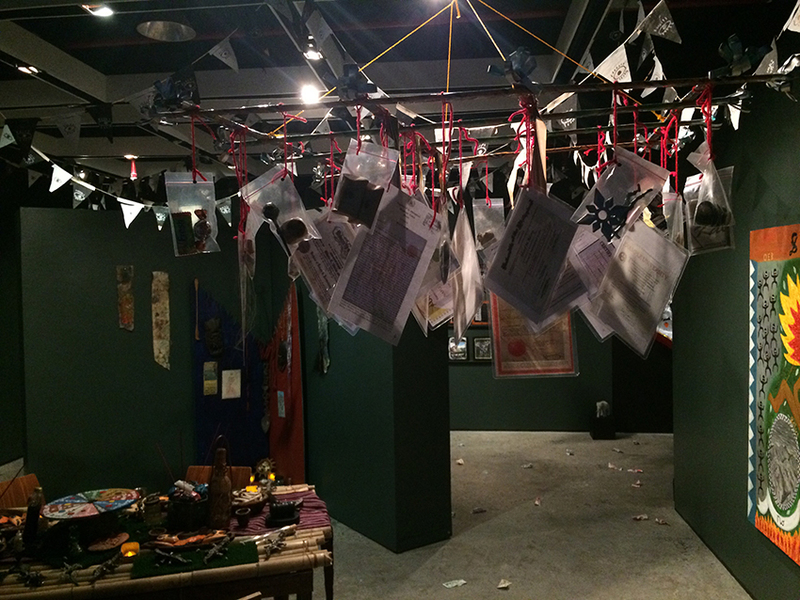 More references to the hegemony of capital are seen in Dayrit’s installations derived from makeshift fiesta decor: Pabitin and Fiesta Kalat, for instance, dangle promises of wordly redemption while testifying to the copious amounts of resources laid to waste each day. On the other hand, the banderitas installation, titled In a Country of the Blind, the One-Eyed Man is King, connotes a broad range of references: from the persisting presence of surveillance to the centrality of vision and seeing in the exercise of hegemonic control. 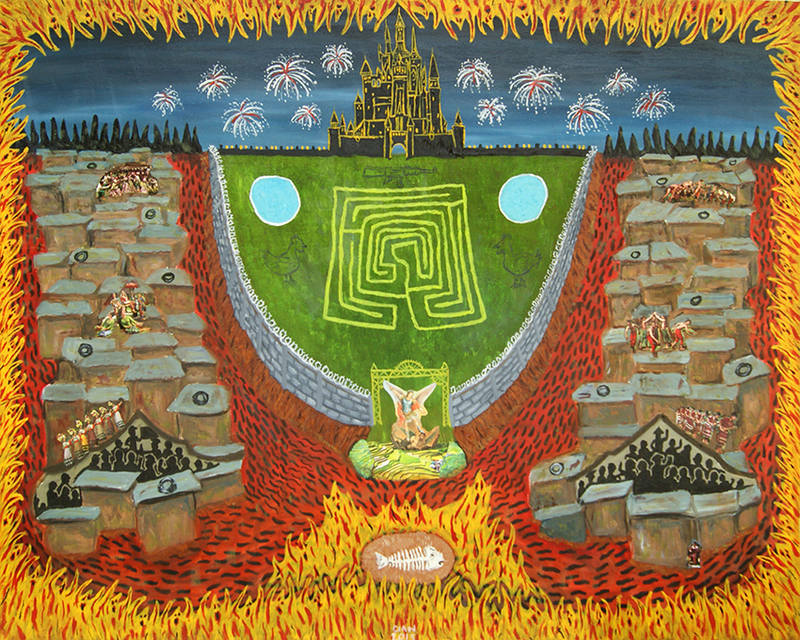 Dayrit also makes numerous critiques of colonialism in his paintings for the exhibition. 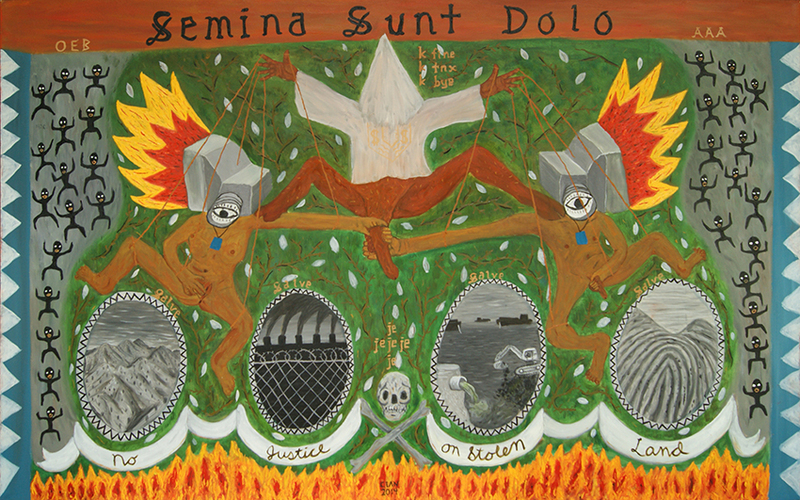 Vested with the iconographic complexity and lore of amulets, his images chronicle occult states and geopolitical realignments in the wake of Western European expansionism: symptoms of the social cancer and critiques of the present world order. The work titled Seeds of Deceit, for instance, chronicles the violence sown by the colonial project on the body politic and the natural ecology of home/ancestral land. 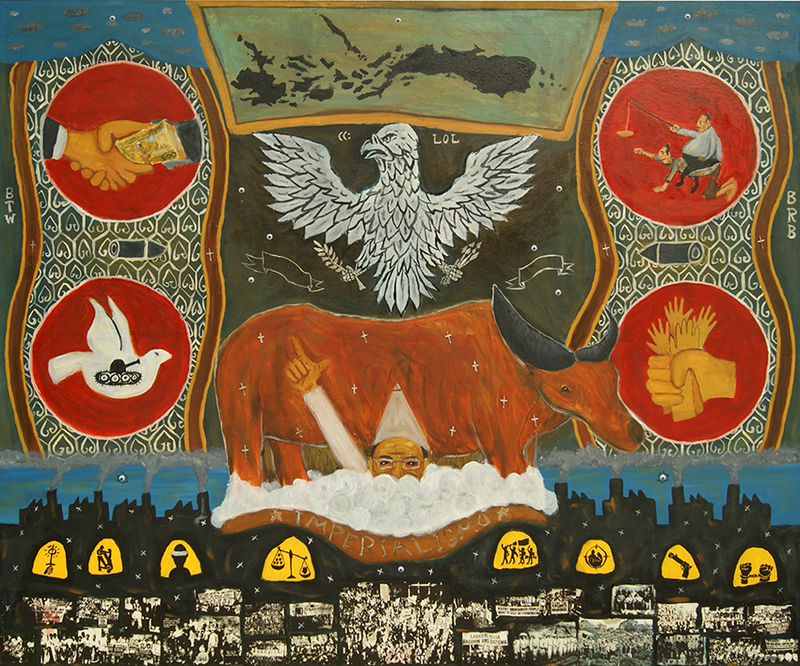 In another painting, titled Signs of the Times, Dayrit utilises popular iconography to further situate and isolate the phenomenon of colonialism and imperialism as key emblems in the visualisation of current social ills. 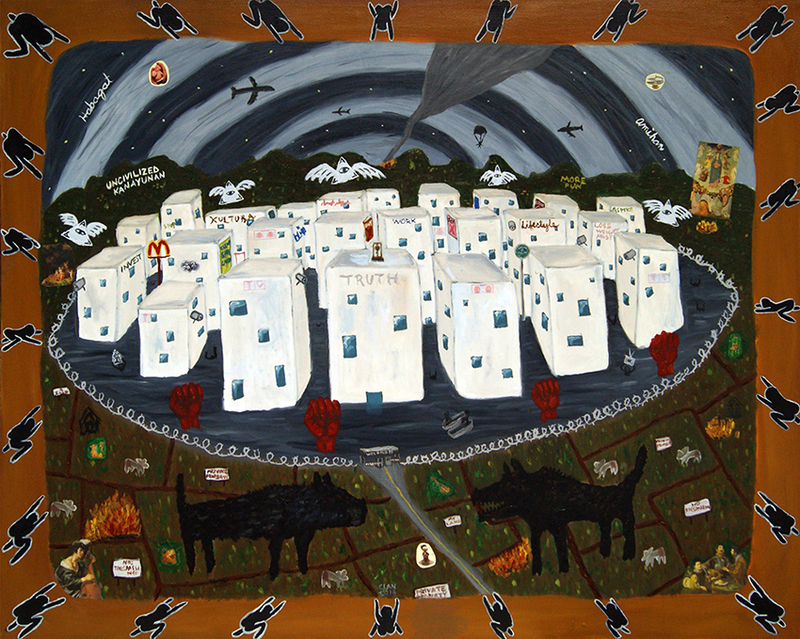 The impacts of such ills on the social landscape are aptly represented in two works: titled Middle Class Suburbia and Heograpiya at Klas-Klasan. Both paintings delineate the cartographic space of colonised, civilised centres: emphasising the stark divide between urban metropolis and rural localities, conquered sites and the wilderness beyond, the loci of development and the entropy of underdevelopment. Dayrit paints in a deliberately naif and ornamental style, using vivid pigments and lavishing attention to minute details, to emphasise how rooted in local realities these phenomenon are. 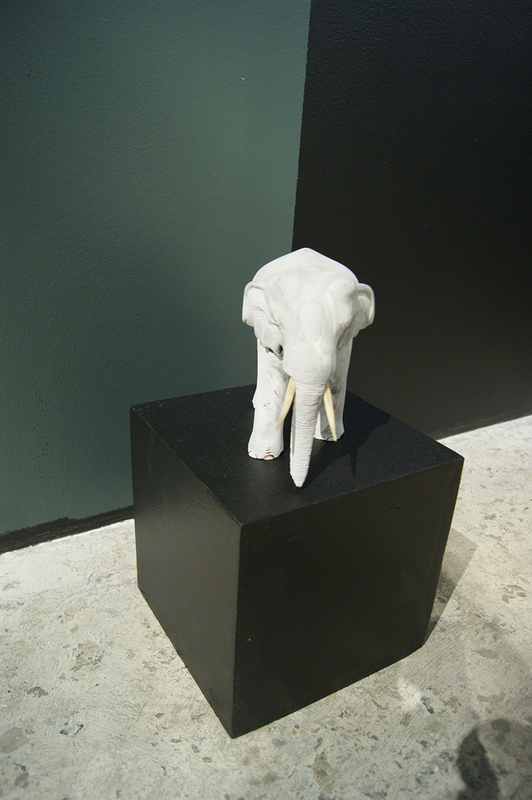 For Dayrit, the process of rumination continues beyond the creation of structural narratives. He fills the gallery space with more such questions from the peripheries: chronicling and collecting his own discrete responses to both the colonial encounter and to the entropy permeating contemporary Philippine life. His intermedia paintings on unclaimed diplomas, titled Various Validated After Thoughts, constitute a series of vignettes and random musings on how the power is filtered and manifest even in the most mundane of matters, while another installation—the final series of texts to be encountered in the gallery space—compiles an entire list of questions, ranging from demographic to personal and political queries to be answered by the viewer. This gesture of questioning marks the space where festivity ends and where remembering begins. In the end, ‘Spectacles of the Third World’ produces a postcolonial pastiche that nonetheless captures with criticality the persistence of hegemony, within and beyond the borders of the Philippines.